Home » Automotive » Wheels » Spinning Rims – What’s The Deal? Spinning Rims – What’s The Deal? A couple of days ago I saw another car waiting at the traffic light with the wheels still spinning. You know what I’m talking about. The car doesn’t move but the wheels looks like they still are driving on the highway with 75mph! It’s a crazy look and I decided to look more into these kinds of wheels. A quick search on Google told me the real name for them is “Spinning Rims”. They do not have any real function, besides making the car look cool, and they work by having the moving part attached to a bearing in the center of the wheel and the centrifugal force will keep the part spinning after the vehicle is stopped. You can buy them many places on the internet, but remember to do some research because there is a big difference on the prices out there and also keep in mind that it can be heavy stuff and the shipping cost just might make it worth picking up your local phone book and look for dealers of wheels and rims in your local area instead. Actually many dealers sell the spinning parts separate as an attachment to your existing wheels and if you buy these spinning attachments only, the price starts around $150 for a set. If you want spinning wheels with the spinning part already integrated, be prepared to pay from $2000 and up for a set. My personal opinion is that spinning rims looks really tacky and especially if they are mounted on a standard car without any other customizing. 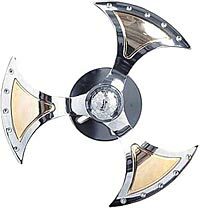 During my search for spinning wheels I actually found some very nice chrome wheels (non-spinning) that would look very nice on my car and I will get more into that in another post.